The London transport bombings of July 2005 prompted no less than eight surveys of Muslim opinion in the United Kingdom within the year. When added to two surveys from 2004, they provide in the aggregate a unique insight into the thinking of the nearly 2 million Muslims in "Londonistan." The hostile mentality they portray is especially alarming when one recalls that London's police commissioner, Sir Ian Blair, recently said that the threat of terrorism "is very grim" because there are, "as we speak, people in the United Kingdom planning further atrocities." The July 7 attacks: About one in 20 British Muslims has voiced overt sympathy for the bombings a year ago. Separate polls find that between 2% and 6% endorse the attacks, 4% refuse to condemn them, 5% believe the Koran justifies them, and 6% say the suicide bombers were acting in accord with the principles of Islam. Without endorsing the attacks, far larger numbers show an understanding for them: Thirteen percent say the July 7 suicide bombers should be regarded as "martyrs," 16% say the attacks were wrong but the cause was right, while 20% feel sympathy for the "feelings and motives" of the attackers. A whopping 56% can see "why some people behave in that way." Help the police? A worrisome number of Muslims would not help the police if they suspected a fellow Muslim was planning a terrorist attack, ranging in different surveys from 5% to 14% to 18%. Violence acceptable? Before 7/7, 11% found it acceptable "for religious or political groups to use violence for political ends" but only 4% thought so after the attacks, showing a rare improvement. Two polls turned up the identical figure of 7% of Muslims endorsing suicide attacks on civilians in Britain. (Among 18- to 24-year-olds, those most likely to carry out such an attack, the number jumps to 12%.) How about suicide attacks on the military in Britain? Positive answers came in at 16% and 21% (with 28% of 18- to 24-year-olds). Are the respondents themselves willing to embrace violence to bring an end to "decadent and immoral" Western society? One percent, or some 16,000 persons, answered in the affirmative. Muslim or British: Polling indicates that a majority of Muslims perceive a conflict between their British and Muslim identities. Two polls show that only a small proportion identifies itself first as a British (7% and 12%), but they differ widely on the number who identify first with their religion (81% and 46%). 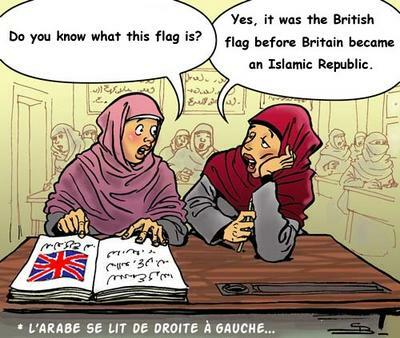 Implementing Islamic law: Muslims widely state that Shariah should reign in Britain. Forty percent approve of Shariah being applied in predominantly Muslim areas, and 61% want Shariah courts to settle civil cases among Muslims. All of 58% want those who criticize or insult Islam to face criminal prosecution. Schools should be prohibited from banning female pupils from wearing the hijab, say 55%, while 88% insist that schools and work places should accommodate Muslim prayer times. Integration into Britain: In a nearly mirror-image of each other, 65% say Muslims need to do more to integrate into mainstream British culture, and 36% say modern British values threaten the Islamic way of life. Twenty-seven percent feel conflicted between loyalty to fellow Muslims and to Britain. Of those who despise Western civilization and think Muslims "should seek to bring it to an end," 32% endorse nonviolent means and 7% violent means. In sum, more than half of British Muslims want Islamic law and 5% endorse violence to achieve that end. These results demonstrate that Britain's potential terrorists live in a highly nurturing community.